Battlecry: Reveal a minion in each deck. If yours costs more, gain +1/+1. It's not HER fault you didn't put a spinning saw blade on your horse. Just had this in my Arena draft. Lost the joust 8 times in a row. 10 mana combo with Nozdormufor instant win. Play at end of rope burn for infinite turns. How does this guy compare to Zombie Chow? In a heavy control deck, you really shouldn't be losing jousts that often. 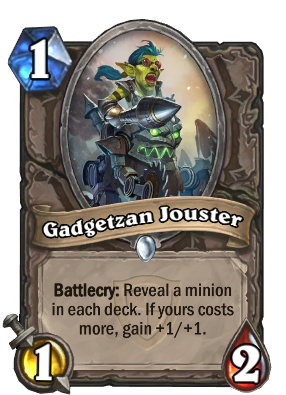 It'll happen once in a while, though, and that's the worst case for the Gadgetzan Jouster. However, the Zombie Chow has the worst case of being a dead draw in the endgame when you can't afford to heal your opponent. I would think an endgame Chow draw happens more often and is more punishing than a lost joust for this card. Am I wrong? This card seems odd to me. If you add two of this you have a chance to reveal the second copy. 1 mana. GG. If you have one or two of this and more joust-cards in a controlish deck you have also the chance to reveal this one. 1 mana. GG again. Doesn't fit to the concept of joust. Yea , but it's designed for Control decks which mostly run high mana minions. So you're probably gonna win the joust. something 5 mana you got about 1/10 chance of getting this. Not mentioning how anti-aggro this joust minions are. I dont have Zombie Chow , that's why. Aside the joke , you're probably right. Zombie Chow , for control decks who don't give a crap about enemy health , is probably better than this. Awesome vs aggro. Goodbye zombie chow? Not in some priest decks at least. And chow is more consistent. This is the biggest reason I'd consider running this card in something like a top heavy control warrior, control paladin, or druid deck. I currently run Zombie Chow in both my druid deck and my paladin deck and in both of those decks there are times I top deck ZC and I can't play it because the 5 life is actually relevant at that point to my opponent (especially in combo druid). If I had this, I'd take a 1/2 over a dead card in hand, and in many matchups that I really want the 2/3 turn 1 (i.e. versus aggro decks), I'm likely to win the joust with the glut of 5+ drops in those decks. Blizzard always tries to keep the mechanics in hearthstone simple and easy to understand. They don't really want to introduce complex mechanics like "average mana cost of minions of your deck", and that doesn't go well with the theme either. At first I also didn't like the Joust mechanic. Then I figured they aren't really too RNG dependent. 1/2 for 1 mana is okay, 2/3 for 1 mana isn't too overpowered since it won't always hit. Every other Joust card is similar in value, if they hit you usually get a minion which should have costed 1 more mana, if they don't, you get something which should have costed 1 less. This is pretty controlled RNG, which is absolutely alright. great method to find out if you are playing vs zoolock or handlock. to bad its after mulligan face, so it really doesn't matter that much. I don't really think aggro will be that strong after TGT release. Why bother having it so you can't see your opponents cards? GREAT IDEA, lets make it so you get to see what your opponent is playing on turn 1.